But What If We’re Wrong? visualizes the contemporary world as it will appear to those who'll perceive it as the distant past. 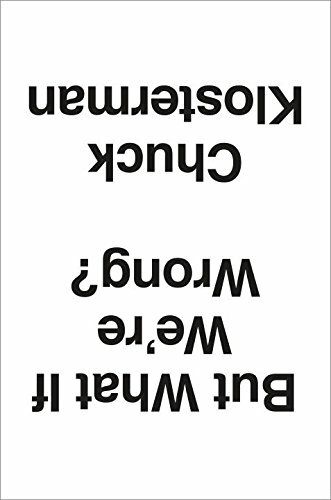 Chuck Klosterman asks questions that are profound in their simplicity: How certain are we about our understanding of gravity? How certain are we about our understanding of time? What will be the defining memory of rock music, five hundred years from today? How seriously should we view the content of our dreams? How seriously should we view the content of television? Are all sports destined for extinction? Is it possible that the greatest artist of our era is currently unknown (or—weirder still—widely known, but entirely disrespected)? Is it possible that we “overrate” democracy? And perhaps most disturbing, is it possible that we’ve reached the end of knowledge?